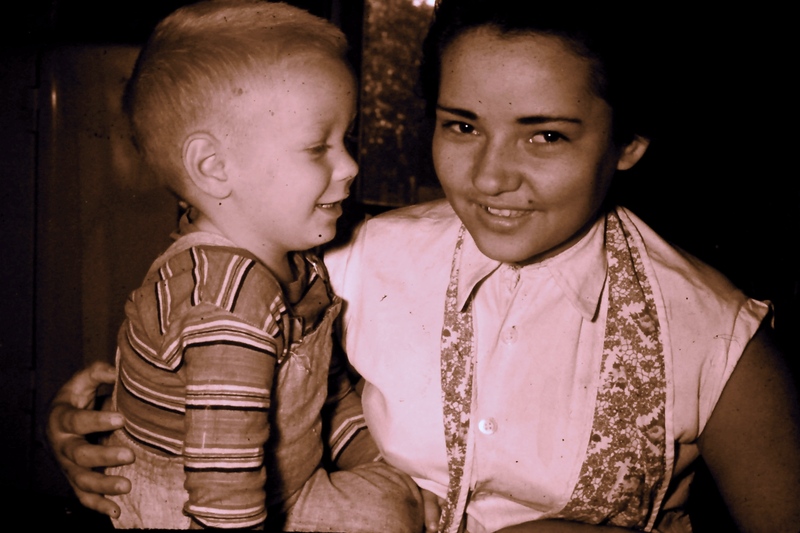 We went to Brazil as missionaries but received more than we ever gave. The beauty of that people and land added to our faith in the eternal Creator. He had his finger in the creation process from billions of years ago to the sustaining of life in every flower and animal. 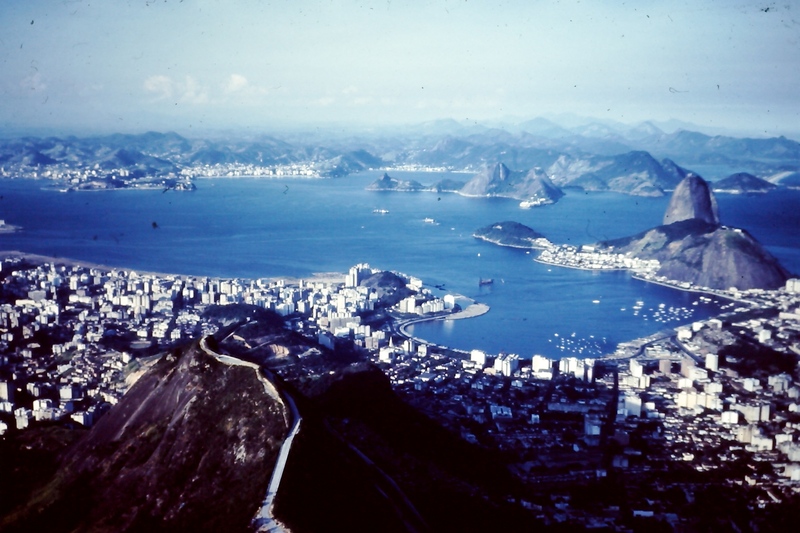 There is beauty in every city but none can quite match the city of Rio de Janeiro that is squeezed between the bay of Guanabara and the Atlantic. As we look across Rio from the foot of the statue of Christ the Redeemer on Corcovado Mountain, we see in the distance another mountain. This is Sugar Loaf. It is startling to see planes taking off from the airport near downtown and watch them fly over the bay, much lower than Sugar Loaf. Then there is the world famous Copacabana beach with other beaches like it that stretch for untold miles to the North and South. 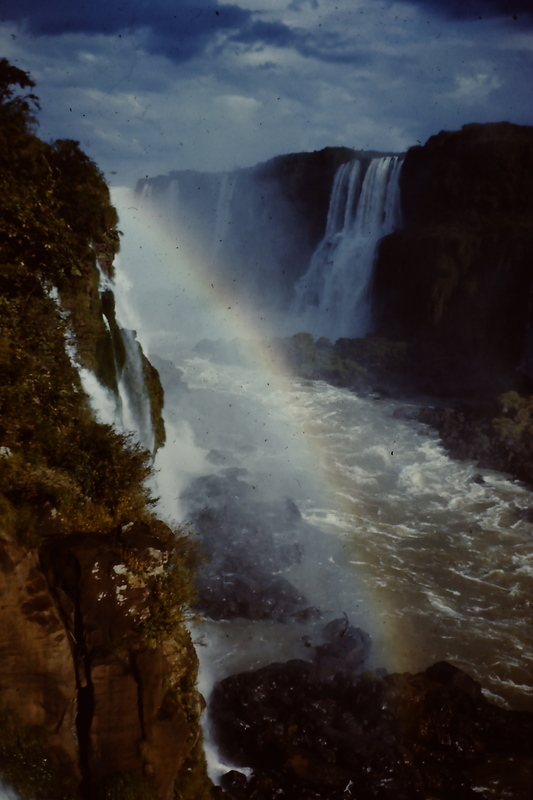 Then there is the Iguaçu Falls that is at the juncture of Argentina and Paraguay with Brazil. From its three Kilometer precipice, at times the quantity of water going over it exceeds both Niagara and the Victoria combined. As our family watched from beside one of its waterspouts, we noticed boys about halfway down jumping from a rock to the swirling waters below. They were just doing it for the fun of it. The evolution of Iguaçu goes back thousands upon thousands of years and though so much older than Rio or the country itself, yet I am amazed at the beauty. Nature didn’t have to be that way for the creator could have made all in multiple tones of black or brown. The joy of the act of creation and our joy of being involved, if no more than just watching—all come together in praise and adoration. During the time we lived in Brazil, beautiful birds such as the parrot or macaw could be bought and even exported. That has now changed for then we had both of these birds. When in the interior of São Paulo, our parrot used to hear us calling Monica, so at daybreak it would begin to screech out her name. Our macaw was a lovely blue and yellow color but there is something else I remember. It had powerful jaws; one day it may have been irritated when I was feeding it—perhaps too late for its liking, it bit my finger bringing blood. No wonder! Those jaws could break open Brazil nuts. 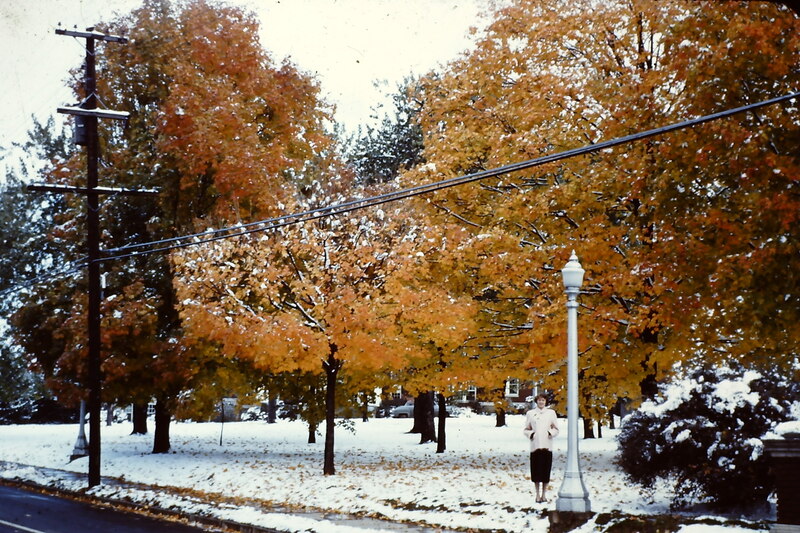 I have pictures of flowering trees and plants but all my pictures were taken at that time were on slide film that with time the colours have changed and faded. 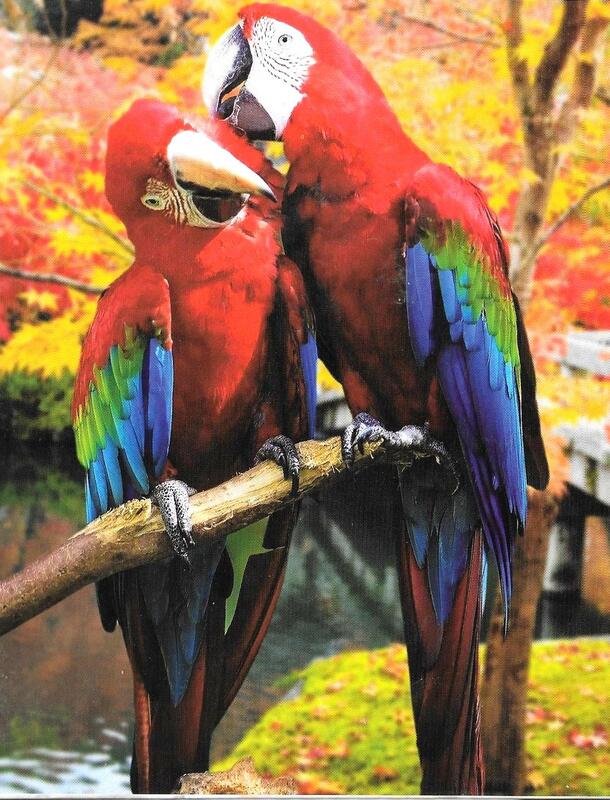 So this picture is not of our Macaw but it shows something of the beauty of those birds. But nothing compares to the children in Brazil for their beauty and the potential of what their lives may become. 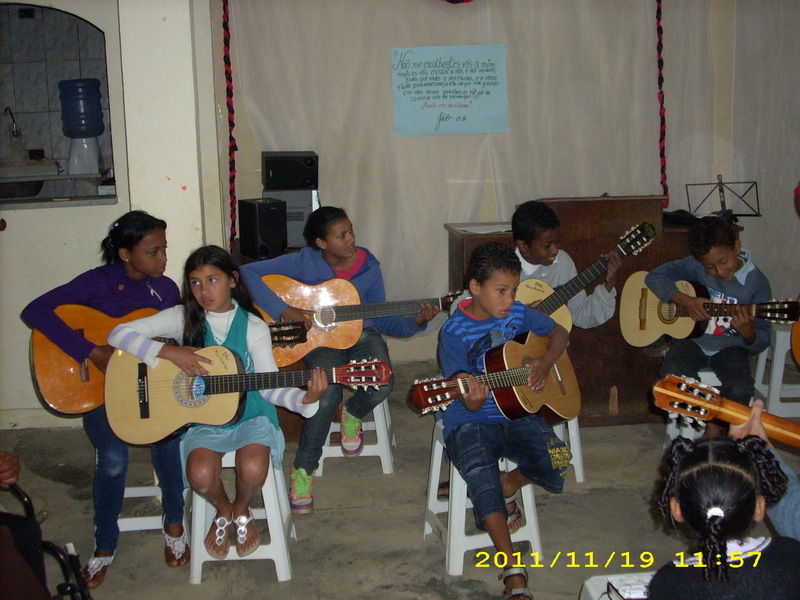 This group from a church planting in a slum was given guitars and lessons hoping all along that music and the presence of Jesus will build their lives to success. Whether living in Brazil or not, when I stop to ponder the beauty in the world, my praises are lifted up to our God that is our Creator. I’m trusting that anyone who reads this blog will know the sense of worship that comes from contemplating the wonders around us. This entry was posted in Uncategorized on April 26, 2018 by rkenny2014. There is no way to ever escape home. That is my personal conclusion, as I’ve written down my memoirs, for again and again I’ve seen much of my life being played out from the home where I was raised. That said, I rejoice in the home created by Doris and our children, Monica and Vernon. Often I’ve told you about Doris’ life and ministry. 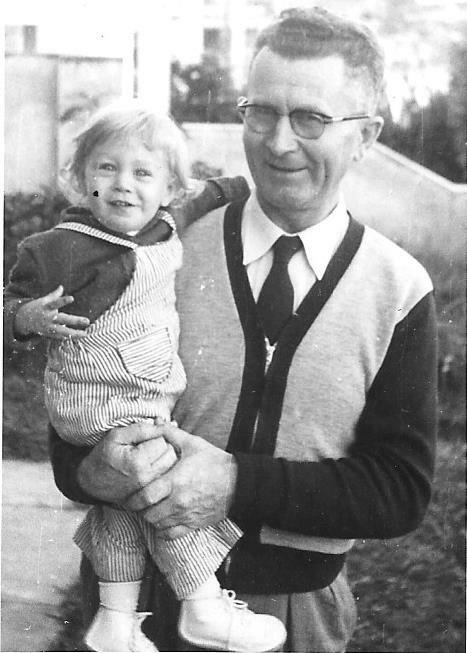 Now I choose this blog to be about our children and how they adapted to wherever they lived. Doris and I were at Asbury Seminary in Kentucky when Monica was born, and in this rare picture she bides her time. Doris went back to nursing on nights a month after her birth so that between us—work and classes we were able to look after her. She was as good a baby I’ve known otherwise we’d have needed other living arrangements. 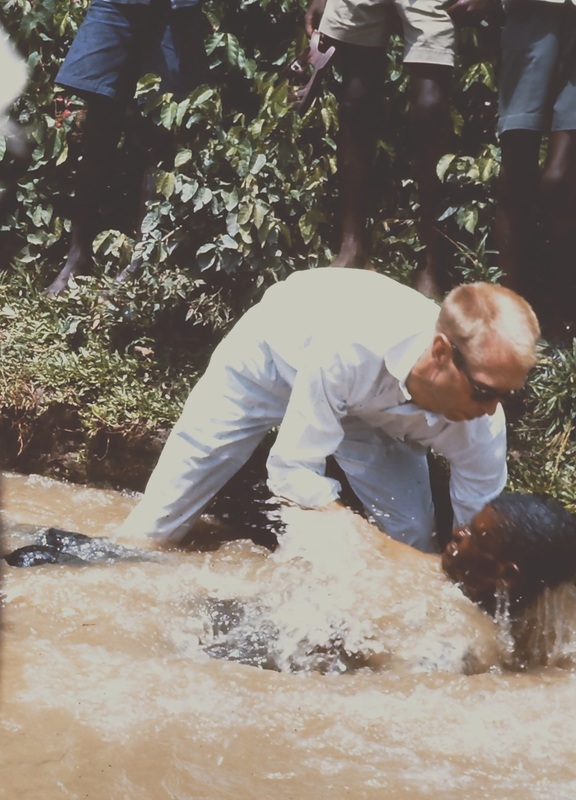 In Brazil everyone took to Monica with her blonde hair and light skin, and that included our fellow missionaries, the Campbells who had grand-children in Canada. Here she is with Murdo from the short time we were together out in the city of Rio Preto. 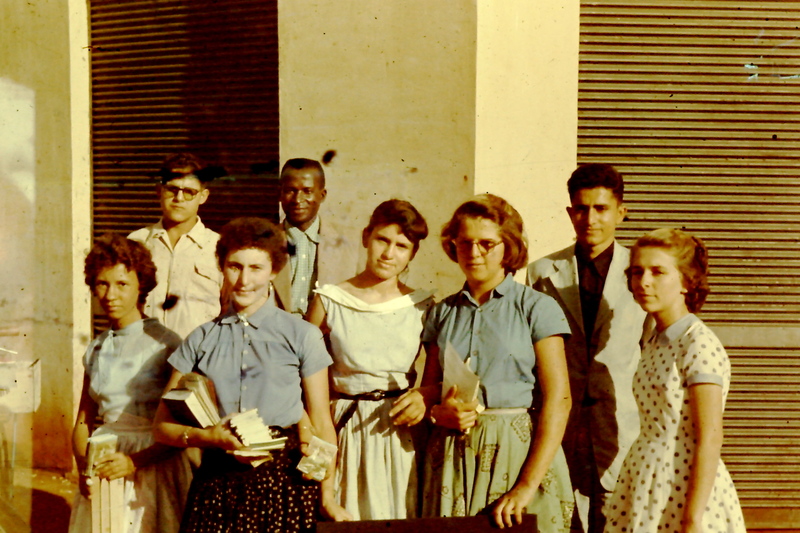 Just months after Vernon was born in Rio Preto he was making friends with Brazilians his age. Since he was born in Brazil, I suppose their outgoing ways attached to him as well. 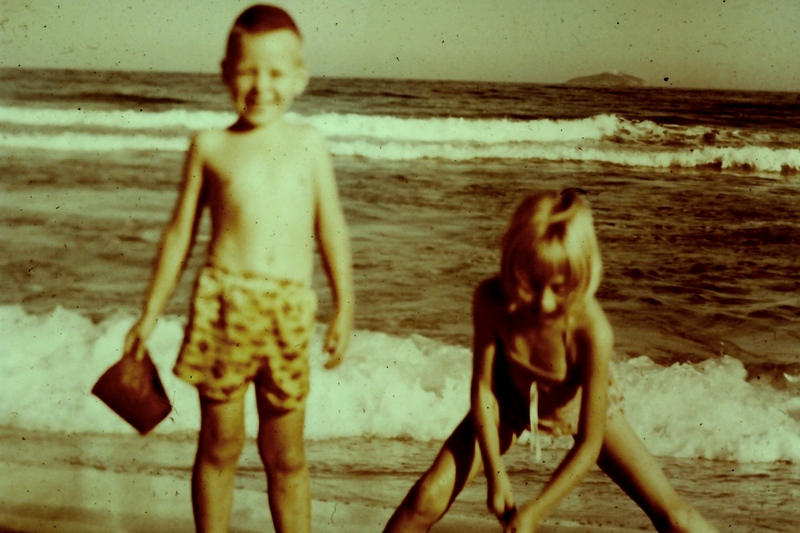 We all enjoyed Barra de Tijuca an isolated beach on the edge of Rio, There our family enjoyed the sand and surf but none more than our children. Our children had the joy of attended a private school run by Baptist friends. They made a positive fuss about every student’s accomplishments. 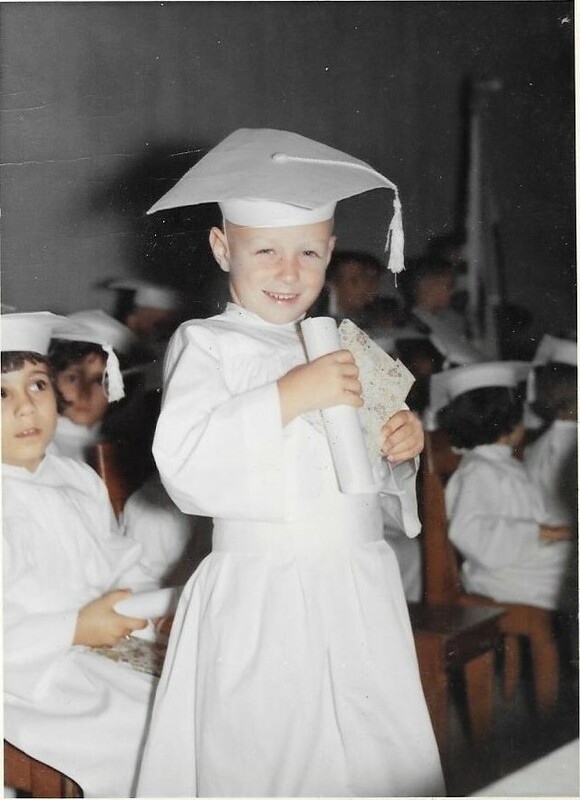 This tells the story of Vernon’s graduation from kindergarten. 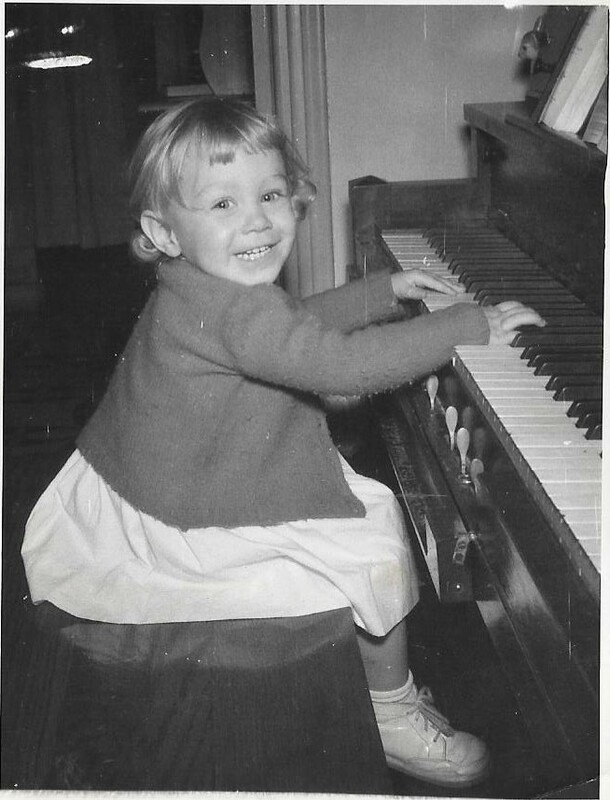 Monica wasn’t taking lessons at this age but her enjoyment of music continued on when she took lessons and later on when she even played the cowbells. There were fun times, good times when our children were on furlough with us. This picture was taken on a lake in the Gatineau out from a friend’s cottage. 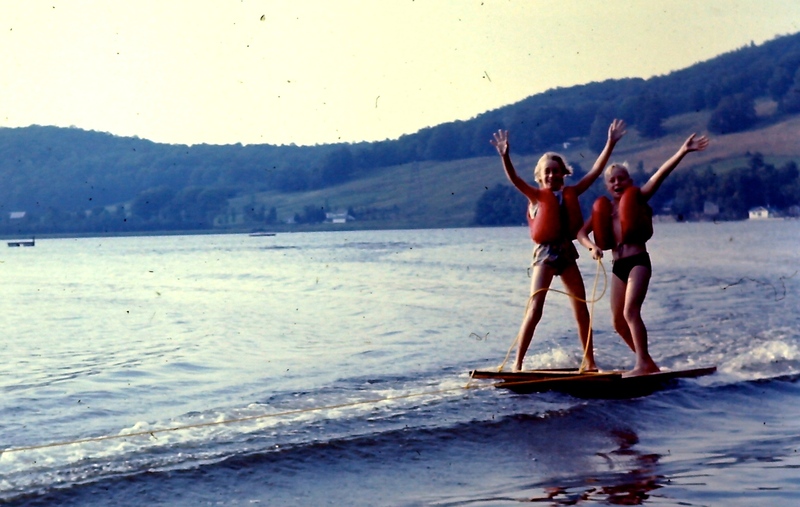 This board is one I made, one on which they had a good time with me towing them behind the Hawley’s boat and motor. As I look back over our time with our children as they grew up, the words of Psalm 23 comes to mind, “The Lord is my shepherd, I shall not want; he makes me to lie down in green pastures.” Surely our shepherd has led us to lie down in green pastures. This entry was posted in Uncategorized on April 18, 2018 by rkenny2014. We found it complicated getting our clothes washed and clean in Brazil. 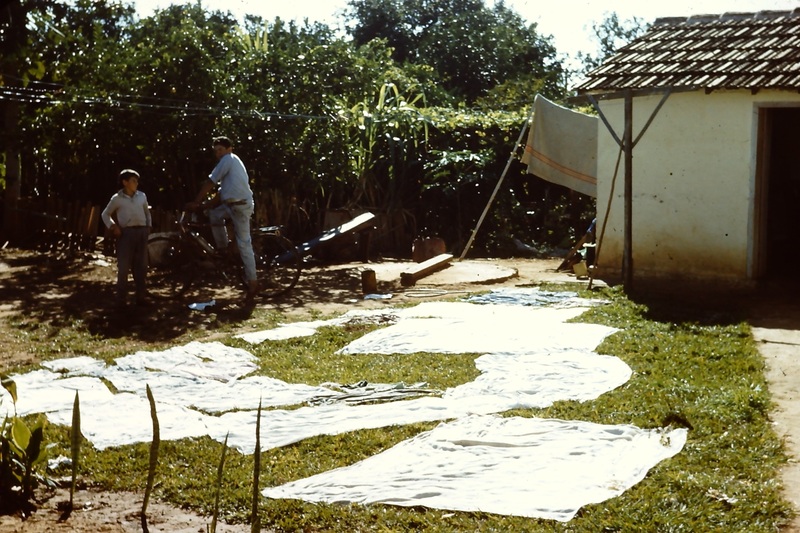 We never did have hot water but putting the clothes on the line helped with the stain from the dust coming from the red soil And we needed to beat the stain that came with the hot weather–well, at times it was just very hot. 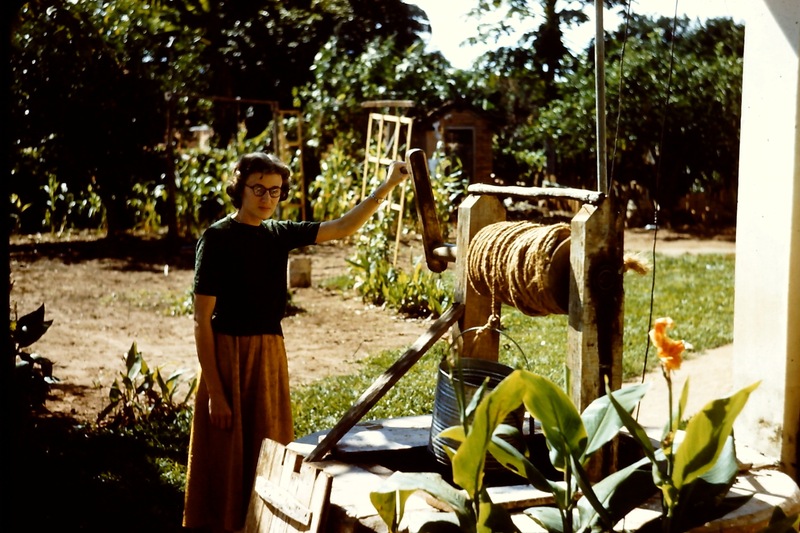 Here is Doris using the windlass at our well in Neves. We soon moved on to an electric pump. We had electricity but not a washing machine. Doris scrubbed the clothes by hand for awhile but soon needed help. For a while our maid took the clothes home to wash. It was the only solution and that was what those who could afford it did in “coffee country.” As Doris and I talked about the washing we had a lady come in and do the washing. The picture tells the story. The result of red dust in the air meant all my white shirts had a pink tinge. Why use white shirts? Well, professional people wore white shirts on work days, on special occasions and in fact, most of the time. For me that included more than Sunday services. Some of those shirts also had small holes that were not noticeable—they came about by riding on the wood-burning trains with the open windows. Imagine those sparks quickly wakening a person out of a deep sleep. As you can imagine the “by hand” washing was hard on the clothes. Doris just said to me as I was getting my details straight, “I couldn’t put up with that.” Besides she objected to paying for every single item. So we saved from our small salary, or was it from gifts from family in Canada? In any case we bought a washing machine, a wringer washer back then in 1957. It was possible to install it in our home in Neves for we allowed for the plumbing as we did a re-building project. By the way, I’m not complaining about the salary under the Holiness Movement church. We knew early all about the challenges we would face and we are thankful for the leadership that did so well to support a huge mission program with a small membership. But when union came with the Free Methodists it seemed we had died and gone to heaven. During our second term in Brazil we bought an automatic washer but the rented house in São Paulo did not have the plumbing for a washer. So we found a spot for it in an oversized toilet in the backyard. We then had to carry the baskets of clothes down a set of stairs to get to the washer. With cold water there was much soaking and scrubbing of the items that were really dirty. In any case the clothes line was close by. 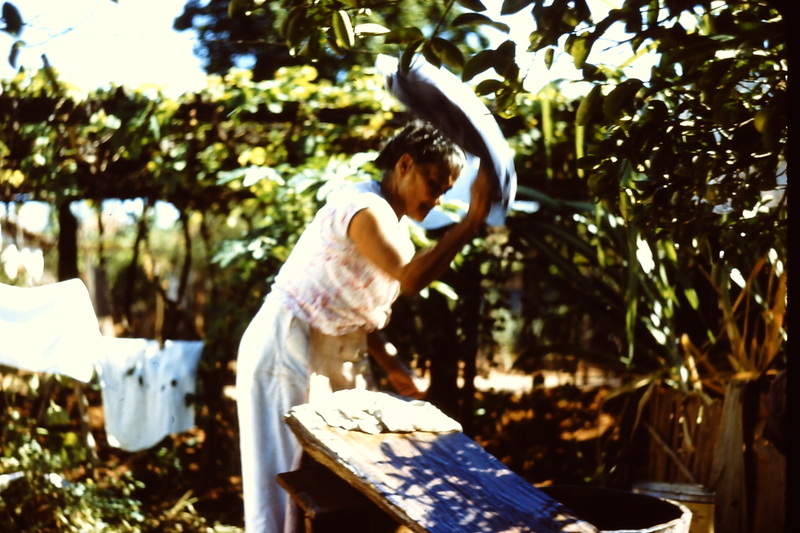 And if the Jobuticaba tree in the yard had fruit, a handful added to the interest in getting the clothes done. Of course if a person did not have a clothesline, then the grass served as a place to dry clothes. But a gear broke in the machine shortly after the end of the guarantee. That is the way most guarantees work but in this case I bought the parts and was able to fix it. When thinking of “washing” a person might recall all the ritual washing laid out in the Old Testament. The good sense of that is obvious—washing saved people from a multitude of diseases. Of course there was also the symbolism—the spiritual cleansing coming from the worship of God. That washing is both a mystery and perhaps more difficult for many than getting those pinkish white shirts of mine clean. St. Paul then makes clear that this washing is offered by “Jesus Christ our Saviour.” With that addition the story of washing clothes in Brazil is complete. This entry was posted in Uncategorized on April 11, 2018 by rkenny2014. The Olympics in Brazil were a smashing success before the world for the government swept clean Rio’s streets of the homeless, drug dealers and children who lived on the streets. Many of those children were abandoned by families that could not feed or clothe them. After a few months on the streets those same children become almost impossible to rehabilitate. Here is a group of youth that came to help us from the Rio Preto Presbyterian church to help us work with children in this hall and other towns. 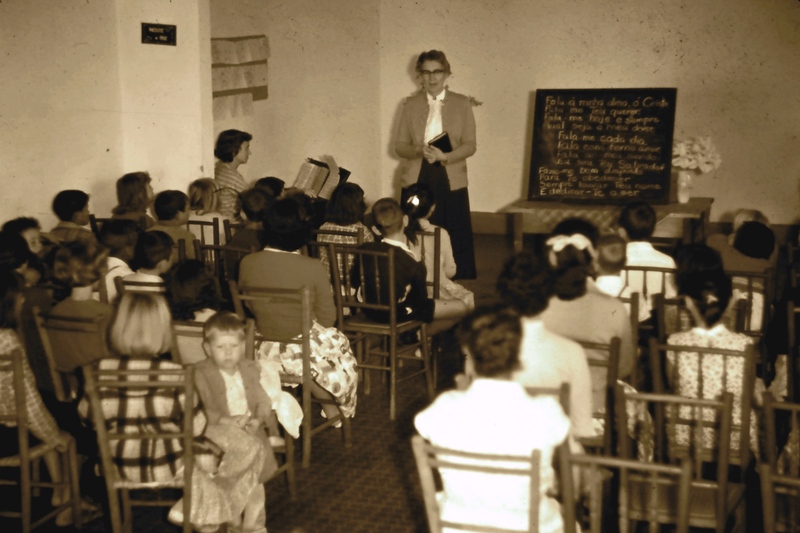 These wonderful folks had a deep concern to teach children the Christian way. We never knew about children being abandoned when we lived in the interior but we were struck hard by the poverty they faced. What can I write as I look back to the wonderful children we met who faced a bleak future on those coffee ranches? I’ve often wondered what became of those to whom we ministered. Most children had little opportunity to get more than a few years of education with absenteeism a central problem. 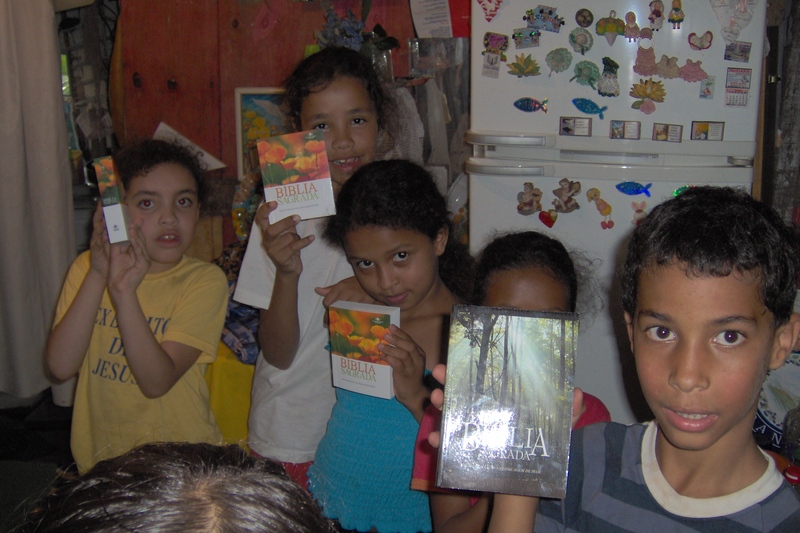 Here children from a Sunday School class show off the New Testaments they have received. The word of God often goes home to the parents who receive the Word and become CRENTES–believers. Here Lucille Damon teaches a song to children while Doris Kenny plays the portable organ. 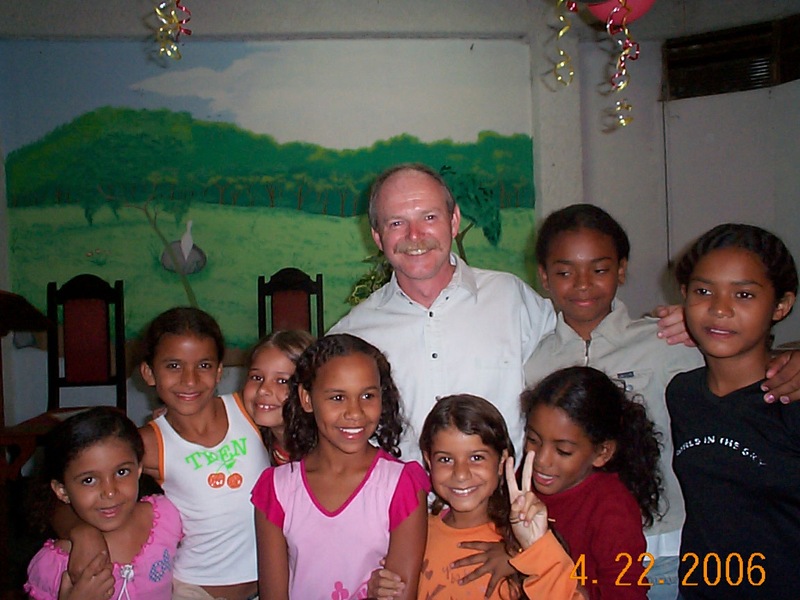 Fred Lester as a faithful VISA volunteer to our church in Brazil for many years poses with some of the children in one of our churches. I look to the church of Jesus Christ and His salvation to provide hope for these children and others. Our church offers everyone the chance to minister through its international program for children. Check it out! Help change the lives of Brazilian children. This entry was posted in Uncategorized on April 4, 2018 by rkenny2014.